This story is based on Hans Andersen’s well known tale. Ming Da, Emperor of China at only nine year’s old has greedy, selfish ministers who steal from him, becoming rich while the people of his kingdom are poor and hungry. He hatches a plan to deal with this. Dressed in rough sacking the young Emperor convinces his foolish ministers he is dressed in finest silks and persuades them to have similar clothes made to wear at the New Year’s parade. The crowd laugh when they see the Emperor and his minsters wearing old sacks. Realising they have been tricked, the corrupt officials run away and Ming Da can now feed and clothe his citizens. There is information at the back of the book into the author’s experiences and her inspiration for the story. The illustrations are striking, amusing and detailed, the parade scene is particularly stunning with lots to spot and talk about. 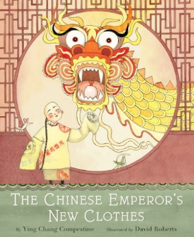 This would be a great story to share at Chinese New Year, there are instructions for how to make a New Year parade costume at the back of the book. Does your child know the Hans Andersen story on which this is based? If not either tell them about it or watch the cartoon version together (see below). Before you start reading the book look at the first image of the Emperor on the throne. What do children notice about him? Read the first few pages with the boy emperor listening to his corrupt ministers & meeting his tailors. What might his plan be? Read the story aloud to your child or take turns reading a page each. Pause to talk about what is happening in the words or the pictures. What do children think about the characters of the Emperor and his ministers, how they behaved and how the ministers were tricked? Talk about anything that puzzles your child, eg unfamiliar vocabulary or Chinese New Year celebrations – see links below. Share favourite illustrations and favourite parts of the story. Did you spot the cricket and mouse, one or both of these feature in most of the illustrations. What would they tell each other about the ministers and how they were tricked? Have an imaginary conversation between them. Children could choose a scene from the story they find the funniest or like the best to draw. Talk about what they have chosen to illustrate. Make a Chinese dragon stick puppet. You can invent your own or use these ideas and resources. Make the puppet move and dance. Read the author’s note about the background to the book together.